Jeremy Corbyn likened Theresa May to Baldrick, saying her “cunning plan” was to have no plan at all [Image: Daily Mirror]. Forget Brexit or Heathrow’s forthcoming new runway – Prime Minister’s Questions today was all about mental health. Karl Turner told a packed House of Commons that his 25-year-old nephew, Mattie, had recently died while waiting six months for a ‘talking cure’ appointment to help him handle depression. He said these treatments were often a dangerous waiting game and a postcode lottery, and asked what Theresa May was doing to sort it out. She stuttered through a non-answer about having established parity of esteem between physical and mental health treatment but accepted there was more to do, and moved on – only to be stopped in her tracks by Labour’s Alison McGovern, who wasn’t satisfied. The Conservative manifesto promised shorter waiting times for people with mental health problems, but prescriptions for anti-depressants are on the rise and waits for treatment are lengthening, she said. Was the Tory manifesto just words, or would the PM ever deliver? Mrs May, out of her depth, reiterated her previous statement. Help came – too late, from Tory MP Helen Whately, who quoted Mrs May’s commitment to improved mental health on the day she became prime minister, and asked a hastily-prepared planted question about the Tory government’s five-year plan for mental health. Mrs May responded with words from a piece of paper that had been slipped to her, showing an increase in appointments of 40 per cent since 2010, but the damage had been done. If she needs a planted question and the help of hastily-scribbled statistics to get her out of a hole, she won’t hold public confidence. There were other disasters. Fellow Conservative Dr Tania Mathias backstabbed Mrs May over her decision to allow a third runway at Heathrow, when air pollution standards were already being breached. Mrs May said air quality standards could be reached, but bizarrely reached toward road transport to help justify herself. Apparently electric vehicles on the roads will help Heathrow airport meet its air quality requirements! Some commentators have accused Mr Corbyn of missing an open goal by neglecting to ask her about her speech to Goldman Sachs bankers, in which she outlined her concerns for business of the UK were to leave the EU after the referendum that, at the time, had yet to be held. But Mr Corbyn was skilful to avoid that; critics would only have attacked him on the grounds that times have changed. 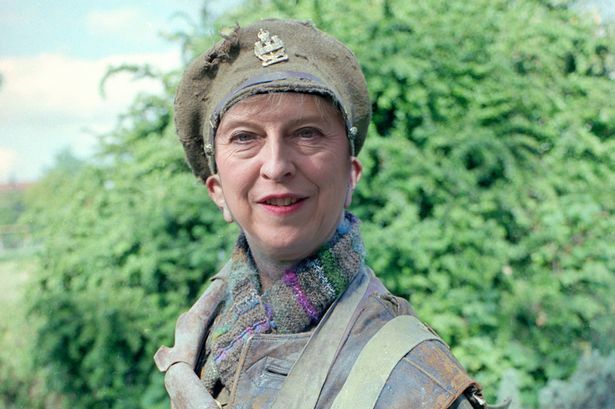 Mrs May’s attempt at a riposte – that the actor playing Baldrick (Tony Robinson) was a member of the Labour Party – was subsequently torpedoed by her own supporters, who gleefully undermined their leader by showing that Sir Anthony does not support Mr Corbyn. It will be interesting to see what the media make of today’s events. Faced with such a disastrous collapse by Theresa May, any attempt to spin the exchange into an attack on Mr Corbyn will be unrealistic – making Mr Wallace’s choice of quote doubly wrong. I would credit “Baldrick” with far more intelligence than Theresa May and he made us laugh. The tories will never take mental health and sufferers seriously, they proved that with Atos and now Maximus! Baldrick always had a plan, not a good one, but he had one, but then why let even simple facts get in the way of a tabloid story. “Corbyn faces no more hostile media than every Lab leader in history. He’s just inept at dealing with it” Tony Robinson. Do you have any evidence to back that up Tony? Because it sounds rather like you just made it up on the spot. Does Tony honestly think that the newspapers and TV stations owned by 5 billionaires will ever support a radical left wing leader who threatens their dominance over British society, regardless of how competent he is at dealing with them? Even Baldrick would have known better than that. I don’t appreciate the use of ‘mental health’ and ‘stuttering’ in the same headline.